The ‘Private Eye test’ is the rule of thumb measure by which national newspaper reporters judge their own conduct. Well, it was two years ago and I’ve no reason to believe it has changed since when I retired. 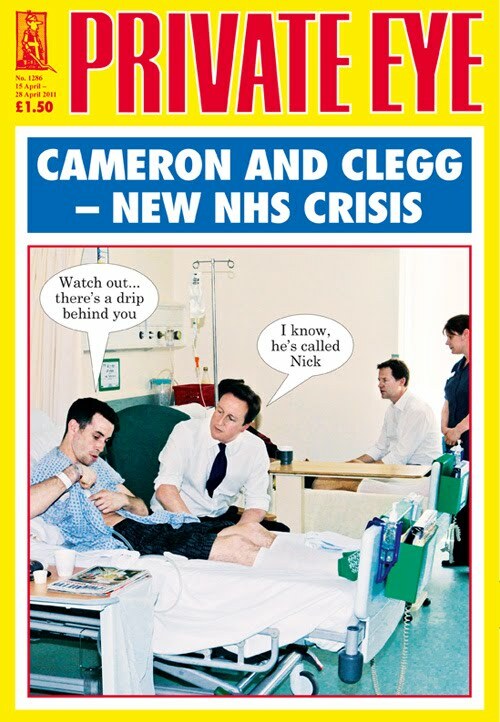 Private Eye is a fortnightly satirical and current affairs magazine which has been going strong since 1961. The test is simply whether the journalist would be embarrassed if his or her words or actions appeared in the Eye. The magazine’s 207,000 circulation includes rival hacks, politicians, PRs, and business people – and no reporter enjoys being ridiculed in front of such an audience. That they still do provides the Eye with plenty of fare for its Street of Shame section. I began reading the Eye when I was still at school for its cartoons and spoofs. It became a regular habit when I started work because it was ‘hot’ on exposing business scandals. This Wikipedia link is thorough although I have to add the caveat that when the Eye has broken any story where I’ve known something about the background, the broad thrust has usually been right but the detail has been awry in at least one fundamental area. I bought a copy today for the first time in a long while. I was glad to see the Eye has lost none of its bite despite the arrival of on-line competitors. Perhaps its very strength is that it’s out there for a fortnight and has to be reasonably certain of its stories. These way readers are spared what turns out to be the unsubstantiated gossip which makes up much of the blogosphere. A quick turn through the highlights of the current issue yielded some gems allowing that the cover was decidedly poor. On the first editorial page there is a reminder of the PFI liabilities legacy left by Labour which is closing hospital wards with the Coalition cuts still to come. Further in, staying with the medical theme, the Medicine Balls column has a withering attack on the NHS’s poor standard of diabetes care. There’s a spoof news article about the Libyan crisis reporting Foreign secretary William Hague as saying “Our boys would go in if we had any.” And a mock ad for a Cry-along-a-Cleggie CD which has the LibDem leader include the track I just called to say I love U-turns. The In the City column remains incomparable this week cutting former CBI boss Lord Digby Jones down to size. I’d say that adds up to a good £1.50’s ($2.45) worth. It's just another comic along with the red tops and now the Daily Mail too. Well GC. With a circ of 207,000 at £1.50 per copy, would you say it is profitable or that it is being subsidised by its owners and rich readers? [Jaffa]. Private Eye is doing well because a lot of what it does is now also on the internet through political and satirical blogs which are usually free. Despite this intense competition Private Eye retains its readership.